SJHS will host two meetings for seventh-grade students and their parents. 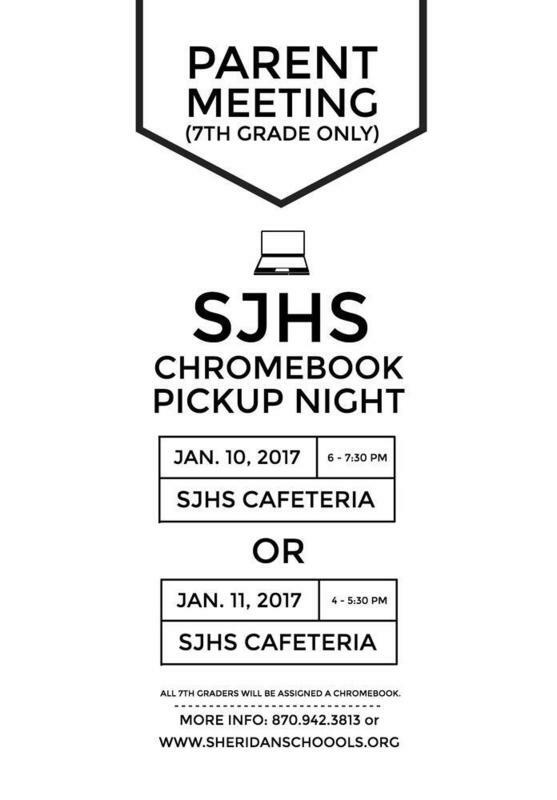 The meeting will be held in the SJHS Cafeteria and attendees may choose from one of the two time-slots: Jan. 10, 6-7:30 p.m. or Jan. 11, 4 – 5:30 p.m. At the meeting, parents/students will pick up Chromebooks after listening to a presentation by Principal Jason Burks and signing the Chromebook Participation Form. Note: both student and parent must sign the form. Individuals who wish to review the form before attending the meeting may access the form here. All seventh-grade students at Sheridan Junior High School will receive a Chromebook laptop to use for their studies. Sheridan School District purchased laptops for these students through a $163,000 grant it recently received from the enhancing Missouri’s Instructional Networked Teaching Strategies (eMINTS) National Center at the University of Missouri College of Education.